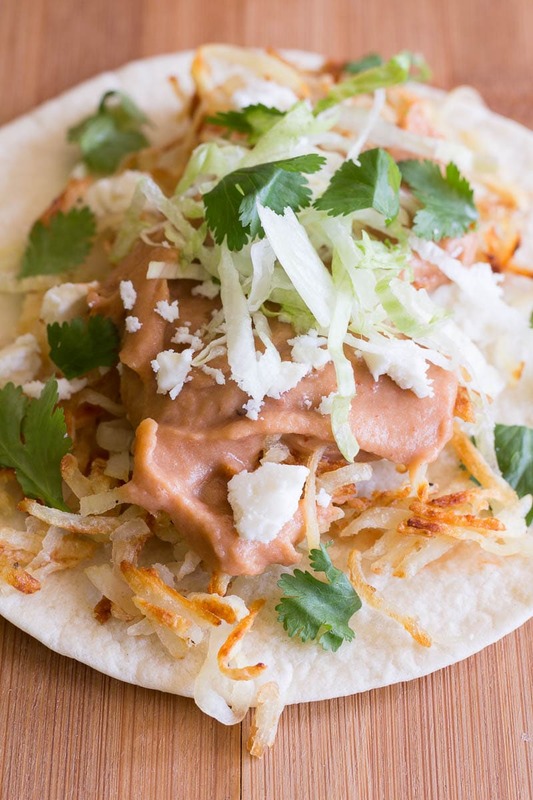 Set up your own hashbrown taco bar with crispy hash browns, chipotle spiced refried beans, and all the tasty toppings! Perfect for dinner with the family. Hashbrowns usually show up at breakfast, but have you ever tried hashbrowns for dinner? Everybody’s always looking for something new and different to put on the dinner table. We get in a rut, and we need to break out of it! One way to do this is to take an ingredient and use it for something completely different. 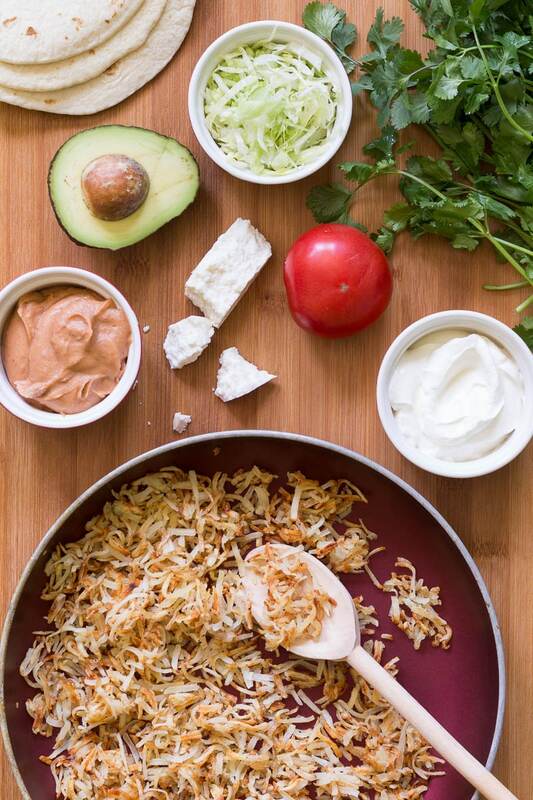 Hashbrowns are staging a dinner comeback in a playful twist on the taco bar. This hashbrown taco bar is perfect for a “Meatless Monday” or any old day of the week that you want dinner to be fast, filling, and fun. 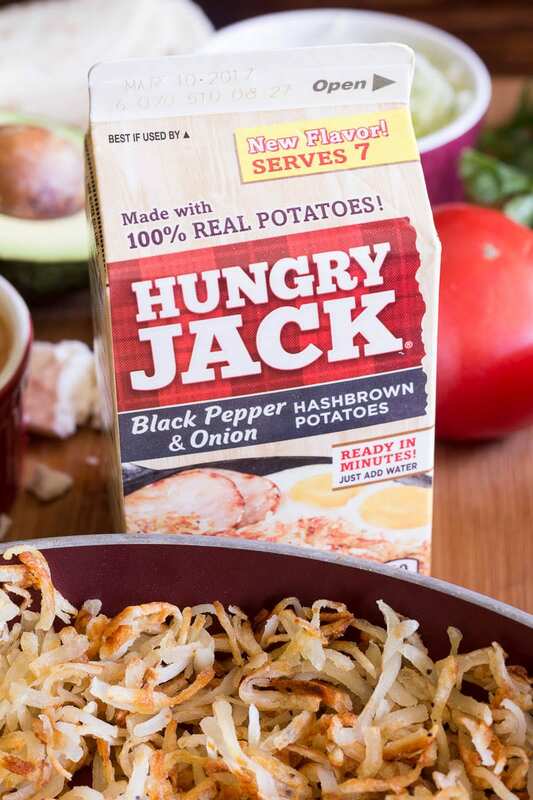 I’m using Hungry Jack Black Pepper & Onion Hashbrowns in my taco bar. The bold flavor is well suited for pairing with salsa, sour cream, and all the veggies you might pile on a taco. You can use this handy store locator to find them near you. You can also enter the Hungry Jack Hashbrowns for Dinner contest by voting for your favorite recipes between May 9 and June 19. You could win a grand prize NASCAR trip! I love spicy stuff, so I blend chipotle peppers into my refried beans. If you’re not into spicy things, feel free to omit the chipotle peppers. Or blend in a little bit of mild sauce for flavor without heat. If you’ve never had fresh Mexican crumbling cheese (also known as “queso fresco”), I highly encourage you to seek it out in the cheese aisle. It adds the perfect flavor and texture to any Mexican dish. There are as many people who love cilantro as those who can’t stand it. Omit it if it’s not your thing. Heat 1 tablespoon of oil in a large nonstick skillet. Cook the hashbrowns, stirring occasionally, for about 15 minutes, or until nicely browned. While the hashbrowns are cooking, combine the refried beans and chipotle peppers in a food processor. Blend until smooth. Set aside. When the hashbrowns are finished cooking, remove from heat. Heat the beans, then set out the beans and the taco bar toppings, then serve the hashbrowns. Enjoy! If you don't like spicy food, you may omit the chipotle peppers in adobo sauce and serve the refried beans plain. Don’t forget to enter the Hungry Jack Hashbrowns for Dinner contest! I LOVE hash browns and could eat them pretty much any time of day. 🙂 I’d totally add these to a pan con bistec (it’s a sandwich with really thinly sliced steak) to give it a crunch. Usually you put those potato crisps that are long and hard, these would give it a good texture! Fun thanks for the idea! Ooooh! I know what a pan bistec is- we have them at a restaurant in town! So good! I love hashbrowns, and breakfast food is perfect any day! Perfect for dinner since potatoes are very filling. I wish we have that brand in the grocery. You’re right, it’s quite filling! And you can change it up with any toppings you like. Hashbrowns are like a comfort food to me and the great thing about them is that they can be pared with almost anything and eaten anytime of the day. Its cool that this can be pared with meat or be a meatless alternative depending on your diet. Exactly. I’m not a vegetarian, but I like to have a meatless option now and again. Lately I’ve been enamored with all sorts of Mexican dishes! This recipe sounds delicious and easy! Plus, my kiddos love shredded hash browns! You know, mine like hashbrown patties, but I’ve never had them try the shredded kind. I’ll have to make them some! This dish looks so good! I wish I was able to smell and taste it through the screen! You’ve combined two of my favorite things, hasbrowns and mexican food. I can’t wait to make this! The hashbrowns have a tasty crunch that’s reminiscent of nachos, so it really does work as a taste/texture combination! I had no idea there was a way to make hash browns like this!! 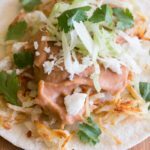 I love hash browns and I love tacos so this is the perfect way to bring two of my faves together…thanks so much for sharing!! I am definitely on board with the peppers and the cilantro. I’d hit mine with a ton of lime juice too. Not sure if I’d actually use the taco shell though or just through all of mine together in a bowl. Good thought. 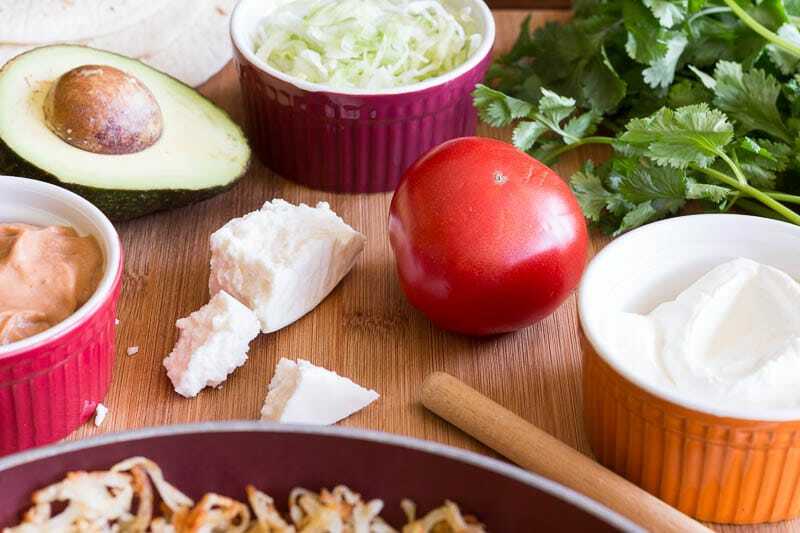 You could definitely skip the tortilla and make a bowl! Say what! This is awesome and I wonder why I have not thought of this before! Such an easy idea! Super easy! And fun, too. A taco bar makes any meal a party. This is a great idea! This would be a fun taco bar to do for breakfast!